Does your resume answer the call or does it leave hiring managers hanging? Are you ready to answer the call of a new job? Before your phone starts ringing with offers, you need a comprehensive resume tailored to call center jobs, says resume expert Kim Isaacs. 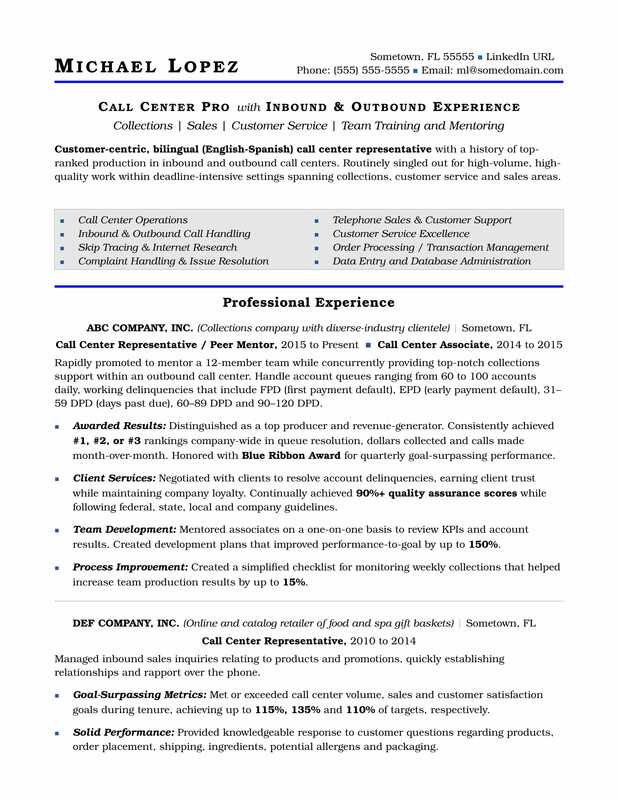 For writing tips, view this sample resume for a call center representative that Isaacs created below, or download the call center representative resume template in Word. Jobs for call center reps are projected to grow by 5% (or 136,300 jobs) from 2016 through 2026, according to the Bureau of Labor Statistics (BLS). You'll find the highest level of employment for this job in the following states: Texas, Florida, California, New York, and Pennsylvania; and in the following metropolitan areas: New York City, Atlanta, Chicago, Phoenix, and Dallas. As a call center rep, you can expect to earn a median wage of $32,890 per year, or $15.81 per hour, according to the BLS. Additionally, you can learn about customer service careers and search for call center jobs on Monster. Customer-centric, bilingual (English-Spanish) call center representative with a history of top-ranked production in inbound and outbound call centers. Routinely singled out for high-volume, high-quality work within deadline-intensive settings spanning collections, customer service and sales areas. Rapidly promoted to mentor a 12-member team while concurrently providing top-notch collections support within an outbound call center. Handle account queues ranging from 60 to 100 accounts daily, working delinquencies that include FPD (first payment default), EPD (early payment default), 31–59 DPD (days past due), 60–89 DPD and 90–120 DPD. Awarded Results: Distinguished as a top producer and revenue-generator. Consistently achieved #1, #2, or #3 rankings company-wide in queue resolution, dollars collected and calls made month-over-month. Honored with Blue Ribbon Award for quarterly goal-surpassing performance. Client Services: Negotiated with clients to resolve account delinquencies, earning client trust while maintaining company loyalty. Continually achieved 90%+ quality assurance scores while following federal, state, local and company guidelines. Team Development: Mentored associates on a one-on-one basis to review KPIs and account results. Created development plans that improved performance-to-goal by up to 150%. Process Improvement: Created a simplified checklist for monitoring weekly collections that helped increase team production results by up to 15%. Managed inbound sales inquiries relating to products and promotions, quickly establishing relationships and rapport over the phone. Goal-Surpassing Metrics: Met or exceeded call center volume, sales and customer satisfaction goals during tenure, achieving up to 115%, 135% and 110% of targets, respectively. Solid Performance: Provided knowledgeable response to customer questions regarding products, order placement, shipping, ingredients, potential allergens and packaging. As a call center worker, you know the value in providing help to customers. Want to get the same kind of help for your resume? Get a free resume evaluation today from the experts at Monster's Resume Writing Service. You'll get detailed feedback in two business days, including a review of your resume's appearance and content, and a prediction of a recruiter's first impression. Don't put your job search on hold. Let Monster help you refine your resume so you can get out there and start applying soon.